The festival ran successfully with almost 60 children participating in the activities, and learning about achieving healthy lifestyle habits for a better future. Representatives from the Ministry of Health and the Ministry of Internal Affairs also attended the festival to deliver social messages on healthy living, child protection, and inclusion. The children learnt about the dangers of excessive sugar intake and the harmful effects caused by maintaining a physically inactive lifestyle. At the end of the hour-long activities the children were tested with some refreshing questions asked by project manager Michelle Paiti. “I was impressed that the children were listening in on the sessions and had grasped the essence of the messages surrounding our theme for this week-that is Diabetes. The huge turnout at the festival came as a good surprise as well for Paiti who noted the significant increase of children who attended on Tuesday. The festival was held in coinciding with World Health Day which was last Thursday 7 April, 2016. 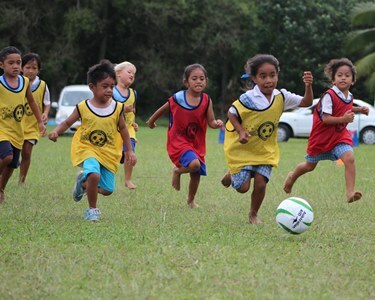 Just Play would like to thank its local partners and sports associations for their continued support towards its community initiatives and working together to bring the programme to communities of the Cook Islands.